I thought some of you might want to check this out. It's cool I must say. Would you have the balls to try this with your drone? Check the link below to see the AUGADRONE. Do you think this is cool or gimmicky? Just a taste of FPV racing. 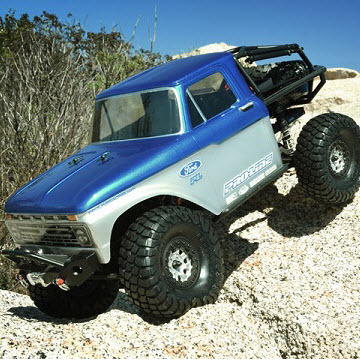 Thinking about slicing the bed off a Pro-Line F-100 for your Trail Honcho? Put the knife down–you can get the cab by itself now. Full details below. Be sure to click over to our New Cars & Gear page for all of the latest Pro-Line releases. Ok this is not RC related but it is good! June, 2017 update: The information here is out of date, The FAA recently changed their regulations for small drones and removed many registration requirements. Please see the FAA site for full details. Well enough boneheads have caused problems so now the rest of us get to suffer... In typical government fashion (Lazy) instead of going after and prosecuting the problem casing individuals. The new rule covers all unmanned aircraft weighing more than 0.55 pounds. And yes, this applies to the drone you're getting for Christmas. The FAA said registration is required for any hobbyist drone weighing between 0.55 pounds and 55 pounds. That weight limit includes even relatively small drones. The FAA is prepared to enforce its rule. "Failure to register an aircraft can result in civil penalties up to $27,500," the rule states. "Criminal penalties for failure to register can include fines of up to $250,000." Thought I would post a pic of the new Tri design I'm working on. What's your preferred breed of dog? Current time: 04-25-2019, 05:55 AM Powered By MyBB, © 2002-2019 MyBB Group.